Here is everything you need to know about Phoenix commercial roof maintenance programs! Their tremendous size alone is responsible for the different maintenance needs of commercial roofs in comparison to residential roofing. Therefore, many roofing companies offer commercial roofing maintenance and inspections. This means that one of our experienced Phoenix roofing professionals will come and check your roof in regular, scheduled intervals to ensure that everything is as it should be. In today’s blog I want to touch on what your roofer is going to be checking for and why it is so important for the health of your roof. One of the easiest signs of roof problems is of course, if you are dealing with a leak. But there are other telltale signs that your roof may be in need of commercial roof repair services. If you notice dark areas, damp spots or condensation inside the roof or the building, it is possible that your roof is leaking somewhere. And even small leaks can be a sign of big trouble. Since water always makes its way down it is also quite likely that the leak is not even where you might suspect. An experienced and trained Phoenix commercial roofing contractor will be able to locate the leak with ease. Mold can be another indicator of a roof leak. Aside from being unsightly it can also be bad for your health. The problem with mold is that it tends to spread. If you notice mold, get it fixed right away to prevent the damage from getting worse and more expensive to fix in the future. While these are some pretty good indicators of roof damage, it is essential to inspect the roof “face to face”, meaning by being on the roof. If your roof is the typical commercial flat roof and you are not afraid of heights, you may be able to inspect it yourself. However, considering insurance regulations and that you most likely have a budget for roof maintenance or even have a Phoenix roofing company contracted for regular roof inspections, you want to leave this one up to the professionals. Because most commercial roofs are flat or almost flat they are more vulnerable to certain issues such as standing or ponding water. During the inspection, your commercial roofing contractor will check the entire roof for areas of ponding or standing water. Why is this a problem? Standing water is an indicator that water is not draining as it should. Maybe the slope isn’t right, maybe the drain or the gutters are clogged or maybe debris prevents the water from getting where it should be. Another common commercial roof problem is the occurrence of bubbles. Bubbles can be a sign of moisture that is trapped under the roofing cover which over time can weaken the roof, cause leaks, cause premature aging of the deck, and make it less efficient against uplift forces during strong winds. Bubbles can also be a sign of trapped gases under the roof cover which could be an indicator of shoddy installation or gases coming from the insulation underneath. Gaping flashing is another common roof problem which cannot only lead to leaks and mold, but also affect the integrity of the roof cover during strong wind and rains. Many flat roofs have skylights. Just like the flashing, it is essential that they are put in properly, have no gaps or deteriorating components and won’t jeopardize the integrity of the roofing system. While we obviously check for damage during these routine maintenance calls, we also help you to save a lot of money. Early detection of roofing issues does not only make your roof last longer and better, but because your roofer will detect roof trouble early on, you will have the option to have it repaired rather than replaced and let’s just say that repairing your commercial roofing system is a heck of alot cheaper than having it replaced. How often your roofer will come and perform his preventive maintenance checks depends on the type of your system and its age. Together with your contractor you can develop a schedule that is perfect for your roof. As with every other professional you hire, you want to make sure he or she is legit. Check if the company has a local and physical address, call the phone number they give you and check them out. It is absolutely okay to check out their ROC and BBB rating. They should be licensed, bonded and insured and not shy about providing references from current and former clients. You may also ask to see their insurance documents. Ask for printed copies of everything from the initial bid to the sign contract and ensure that the scope of their services is clearly spelled out. I understand that roofing maintenance programs can seem like an unnecessary expense, but should there be something wrong with your commercial Arizona roof, you will be glad you had it checked, because it will save you so much money. A properly maintained commercial roof’s purpose as defined by the International Building Code (IBC) is to protect the building and continued preventive checks ensure that your roof is doing just that. If you are in need of an experienced and trusted local roofing company to assist you with Phoenix roof maintenance or repair services for your commercial roof in Arizona, contact us today. 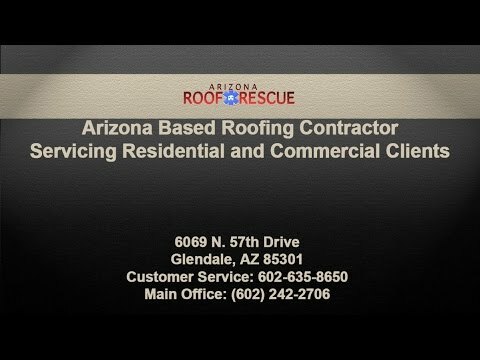 The roofing professionals with Arizona Roof Rescue have decades of experience and have worked on a wide variety of commercial roofing structures all over the valley. We have great ratings with the ROC and BBB and are licensed, bonded and insured. Call our office today to learn more about our comprehensive Arizona roofing services.